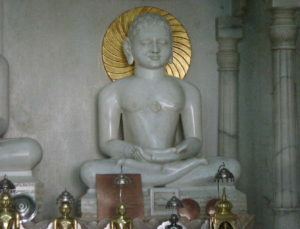 Mahavir Jayanti celebrates the birth of Lord Mahavir, the founder of Jainism. Lord Mahavir was born in the 5th Century B.C. in the kingdom of Vaishali to King Siddhartha and Queen Trishala. His birth was heralded by a series of auspicious dreams. Lord Mahavira ruled his kingdom successfully but at the age of thirty renounced the world and undertook austerities and became a Jina, a conqueror of the self. He is worshipped as the 24th Tirthankar and the festival celebrates his birth. Jains belonging to all sects visit temples and there are colorful processions with pictures of Lord Mahavir. The core message of non violence and love are reinforced through a series of discourses held in the Jain temples. He opposed animal sacrifice and other misleading rituals and preached the path of Ahimsa or Non-Violence. He did not believe in the caste system and he was above distinction of caste, creed and gender. Women were not deprived from studying scriptures or any other restrictions. Moral, social and ethical values were more important to him than physical or social differences. Instead of using Sanskrit which was not known to all he used Ardha Magadhi which was the local language at that time for his discourses. Along with the usual spiritual practices like worship, meditation etc he insisted upon welfare activities for spiritual development. The Shravaks(laymen) in his organisation were from all walks of life.eg Ajatshatru, Shrenik were Kings, Saddalputra was a potter, Anand was a farmer, Sulas was a butcher etc. The foundation of his philosophy was equanimity, knowledge, discipline and detachment. The basis of the Code of Conduct was Ahimsa and the basis of spiritual purity was Anekant or relativity of thought. He used compassion and calmness to change those who opposed him.